Are patriotic political Christians making the same mistake of idolatry and adding man-made traditions as early church did? Be sure to review all the articles linked to at the end of that article. the question I have is this: Are American patriotic / political Christians making the same mistake in a different area that the early church did by the over-exalting of Mary, neglect of the doctrine of justification by faith alone in the NT; and the additions of other man-made traditions? This was posted in a Facebook public group entitled, Martin Luther and the Reformation. The group is an oddity in that it wants nothing to do with authentic Lutheranism: "A word of WARNING: We are not here to 'defend Lutheranism'...and those who teach baptismal regeneration and Sacramentalism will be REMOVED from the group." Riches are the pettiest and least worthy gifts which God can give a man. What are they to God's Word ?—Yea, to bodily gifts, such as beauty and health; or to the gifts of the mind, such as understanding, skill, wisdom? Yet men toil for them night and day, and day and night, and take no rest. 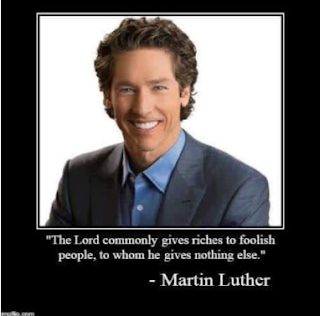 Therefore our Lord God doth commonly give riches to foolish people, to whom He gives nothing else.—Luther. A fearful Example of Covetousness. A COVETOUS farmer, well known at Erfurt, carried his corn to sell there in the market; but holding it at too dear a rate, no man would buy of him, nor give him his price; he being thereby moved to anger, said I will not sell it cheaper, but will rather carry it home again and give it to the mice. As he came home therewith, an innumerable number of mice and rats flocked about his house and devoured up all his corn. And the next day following, going out to see his grounds, which were newly sown, he found, that all the seed was eaten up, and no hurt at all done upon the grounds belonging to his neighbours; this certainly was a just punishment from God, and a token of his wrath against the unthankful world. Three rich farmers have lately hanged themselves: such wretches that do rob the whole country, are worthy of those punishments; for the dearth at this time is a wilful dearth. God hath given enough, only the devil hath possessed such wicked cormorants wilfully to make this dearth. They are thieves and murderers of their poor neighbours. Christ will say unto them at the last day, "I was hungry, and ye have not fed me, etc." Do not think (thou that sellest thy corn so dear) that thou shalt escape punishment; for thou art an occasion of the deaths and famishing of the poor; the devil will fetch thee away. They that fear God, and trust in him, do pray for their daily bread, and against such robbers as thou art, that either they may be put to shame, or be reformed. A man that dependeth upon the riches and honour of this world, and forgets God, and the welfare of his soul, is like to a little child that holdeth a fair apple in the hand, which on the outside is pleasing to behold, and thinketh it hath also some goodness within, but it is rotten and full of worms. Where great wealth is, there are all manner of sins; for through wealth cometh pride; through pride, dissention; through dissention, wars; through wars, poverty; and through poverty, great distress and misery. Therefore they that are rich, must yield a strict and great account; for to whom much is given, the same must give an account of much. Riches, understanding, beauty, and comeliness are fair gifts of God, but we abuse them shamefully. Yet, notwithstanding, worldly wisdom, and a witty brain are evil things, when the cause engaged in is evil; for we used to say, No man will yield from his own conceit; every one will be right. Much better it is, that one be of a fair and comely complexion in the face, for a sickness may come and take that away; but the mind and conceit, is not so soon altered. It is written, Ye shall be like God: yea, I suppose we are like God. This disease is from Adam conveyed unto us, "Ye shall be as Gods." Riches is the smallest thing on earth, and the least gift that God bestowed on mankind. What is it in comparison of God's Word? yea, what is it to be compared with corporal gifts; as beauty, health, etc? nay, what is it to the gifts of the mind; as understanding, art, wisdom, etc. Yet are men so eager after it, that no labour, travel, nor danger is regarded in getting of riches, there is in it neither matter, form, effect, or cause, or any thing else that is good; therefore our Lord God commonly giveth riches to such, from whom he withholds all spiritual good. This text be located in a Latin / German mix in WA 5:240. It was a Table Talk utterance recorded by Caspar Heydenreich. LW includes this text (LW 54:452). “Riches are the most insignificant things on earth, the smallest gift that God can give a man. What are they in comparison with the Word of God? In fact, what are they in comparison even with physical endowments and beauty? What are they in comparison with gifts of the mind? And yet we act as if this were not so, The matter, form, effect, and goal of riches are worthless. That’s why our Lord God generally gives riches to crude asses to whom he doesn’t give anything else.” Luther, M. (1999). Luther’s works, vol. 54: Table Talk. (J. J. Pelikan, H. C. Oswald andH. T. Lehmann, Eds.) (Vol. 54, p. 452). Philadelphia: Fortress Press. I've mentioned this often during the years: Luther didn't write the Table Talk. It is a collection of second-hand comments written down by Luther's friends and students, published after his death. Since the statements contained therein are purported to have been made by Luther, they should serve more as corroborating second-hand testimony to something Luther is certain to have written. Certainly Luther spoke out against greed and placing false hope in riches. What would Luther have written about the person pictured above? One can only speculate, but the words would probably not be as kind as those recorded in the Table Talk utterance documented in this entry.